Ron was born in 1963. He attended Beechcroft High School in Columbus, graduating in 1982. One month out of high school, on June 10, 1982, Ron enlisted in the United States Marine Corps Reserves and served in active duty until April 13, 1983. From 1983 to 1986, Ron worked at Tire America in Seville, Ohio as a Service Manager. He attended Columbus State College from 1983 to 1988, majoring in Finance. From 1986 to 1993 he worked at Nationwide Insurance, United Insurance in Columbus, and American Loyalty. On February 7, 1993, Ron joined the Cincinnati Police Division as a Police Recruit. On June 27, 1993 he was promoted to Police Officer, issued Badge Number 375, and assigned to District 1. He rotated to District 5 (1012 Ludlow Avenue) on July 17, 1994. During 1995 he was assigned to the Criminal Apprehension Team (CAT). During 1996, he was additionally assigned to the Division’s Special Weapons and Tactics (SWAT) Team. On January 26, 1997, after competing in his first promotional examination, he was promoted to Police Specialist and issued Badge Number PS121. By December 1997, with only 4¾ years’ experience, he had already received 10 letters of appreciation and/or commendation; including 4 from Police Chief Michael Snowden and 2 from Patrol Bureau commanders. He clearly had a distinguished career in front of him. Dan was born January 8, 1962 to Cincinnati Police Officer Robert L. Pope and Mary Jane Pope. He attended North College Hill High School and graduated June 1980. By then, his father was serving as a Lieutenant in the Program Management Bureau. During the summer of 1979 Dan worked at the Clovernook Country Club. During his senior year, he worked at Roy Rogers. After high school, he worked in the stockroom at McAlpins in Northgate. He also attended a year at the Raymond Walters Branch of the University of Cincinnati and majored in Liberal Arts. During February 1988, he took a dispatcher job at Nightingale Medical. During December 1990, he married his wife, Linda, a Cincinnati Fire Fighter. Six years after his father retired, Dan joined the Cincinnati Police Division as a Police Recruit on September 15, 1991. On February 2, 1992, he was promoted to Police Officer, issued Badge No. 256, and assigned to District 3 (3201 Warsaw Avenue). On November 14, 1993, he rotated to District 4 (4150 Reading Road). A year and a half later, he transferred to District 5 (1012 Ludlow Avenue), where, according to his supervisor, he was becoming a relief leader and sought out by others for advice and assistance. District Commander, Captain Phyllis A. Caskey, wrote him a District-Level commendation in November 1995 for the capture of two armed robbers. During 1996, he was assigned to the District 5 Criminal Apprehension Team (CAT) where his sergeant assessed him as an “aggressive officer who seems to be working well” with his partner, Specialist Ronald Jeter. Alonzo Davenport’s 20 years of life had not been so distinguished. He was not raised by his parents, but by his great-grandmother, on Republic Street. He played basketball for Porter Junior High School and Taft High School, but had several brushes with the law as a juvenile. At 18, he fathered an illegitimate child. By 19 he had two traffic convictions. At 20, he fathered a second illegitimate child by another mother, Alana Strother, and was living with her at 28 W. Hollister. On March 15, 1997 he was charged with Domestic Violence (later convicted). Ten days later, he was charged with drug possession. The next month, he was charged with another drug possession charge. During October 1997, another Domestic Violence charge, this time a felony. Also in October, he was charged with passing bad checks and another Domestic Violence at the end of October; this one for striking Miss Strother, kicking her, and pushing her into a wall while she held their infant child. In November 1997, their landlord evicted them and shut off their utilities; but they stayed in the apartment, playing rap music until all hours of the night, and disturbing the neighbors’ sleep. The day after Thanksgiving, since 1972, had been the traditional start for the annual Robbery Task Force, usually consisting of hand-picked men and women from districts and investigative sections. During 1997, Specialist Jeter and Officer Pope had earned their slots in the Task Force. Davenport was on probation and piling up warrants when, on December 3, 1997, at 23 West Hollister Street, he fired a shot through Miss Strother’s door. On December 4, 1997 at 9:41 p.m., while dressed in plain clothes and with uniformed Officer Shyane Baker, they responded to 23 West Hollister Street for a report of an assault and a man with a gun. The complainant, Miss Strother, reported that Davenport had held a gun to her head and threatened to kill her. Several officers tried to find and apprehend Davenport during the night, but to no avail. The next night, on December 5, 1997, at 11:55 p.m., Specialist Jeter and Officer Pope parked their undercover police vehicle in the area and walked to 23 West Hollister in another attempt to find and arrest Davenport. Davenport, Angela Mills, Lisa McCollum, and Marvin Jones were inside the “vacant” apartment at 23 West Hollister. Davenport looked out the front bedroom window and saw the officers approach, but after a few minutes he thought they had left. A few minutes later, Specialist Jeter and Officer Pope knocked on the door. Davenport walked to a recliner and retrieved a Charter Arms Undercover .38 Special revolver (which had been stolen years before). He walked to the door and asked, “Who is it?”, while placing the handgun in the small of his back. The officers identified themselves with their badges and asked if Davenport was there. Davenport opened the door and allowed the officers to walk into the apartment. Officer Pope’s attention was immediately drawn to Jones who was smoking a marijuana cigarette. Davenport identified himself as “Keith” to Specialist Jeter, but he was not fooled and ordered Davenport to put his hands behind his back. Davenport initially complied, but then he began flailing his arms and resisted being handcuffed. Officer Pope came to his partner’s assistance. Specialist Jeter took hold of Davenport’s right arm and Officer Pope took his left. Davenport yelled, “F— you all, man! F— you all! I ain’t gotta do s—.” He managed to free his right arm, reach into the waistband, and pulled the revolver. Specialist Jeter yelled, “Gun! Gun!” and Davenport fired twice, striking each officer in the head. He then ran from the apartment. His associates left the apartment too. None attempted to render assistance to the dying officer(s). Once outside, Jones called 9-1-1 at 11:57 p.m. and advised Police Communications Section that two undercover officers were dead in the apartment. Davenport was still running to West McMillan Street near Scioto Street, when several plain-clothed police officers, unaware of the shooting saw Davenport, became suspicious, and gave chase across Calhoun Street and into the Saint George Church parking lot. Police Officer Brian Ibold drove near Davenport and identified himself as a police officer. Davenport took off running again and Police Officers Tim Campbell and Amy Abney gave chase. As they ran into Classen Park at 2557 Jefferson Avenue, Davenport abruptly stopped, turned, reached into his waistband, withdrew his revolver, placed it to his right temple, and at 11:58 p.m., pulled the trigger. The resulting shot caused his instant death. Sergeant Christopher Ruehmer, Officer Pope’s best friend and fellow Recruit Class graduate, was the first to arrive at the Hollister scene, on December 6, 1997 at 12:47 a.m. and found the officers. Officer Pope was deceased. He was transported to University Hospital, pronounced dead at 1:07 a.m., and then to the Hamilton County Morgue. Specialist Jeter was transported to University Hospital and kept on life support until his mother could be flown from Columbus to Cincinnati. He was taken off life support and died at 8:45 a.m. He was an organ donor and his organs continued to be a life saver even after his death. They became the first Cincinnati Police officers killed in the line of duty since Police Officer Clifford George was gunned down at another Domestic Violence call little more than 1500 feet south of Hollister and 10 years earlier. Officer Pope was survived by his parents and wife. His remains were laid out at Mihovk-Rosenacker Funeral Home on Cheviot Road in Green Township. For 8 hours, thousands of law enforcement officers filed by his casket. A Mass of Christian Burial was celebrated on December 10, 1997, at the Cathedral of Saint Peter in Chains, where 1200 people filled the Cathedral and thousands more watched on closed captioned television monitors at the Convention Center, three blocks from the Cathedral. Additionally, all three local television stations broadcast the funeral to 225,000 homes. Pall Bearers included Paul Weber, Cincinnati Fire Captain Robert L. Pope, Jr., Chris Metzner, and Police Officers Tim Haines, Christopher Ruehmer, and Mike Drexelius. Officer Pope’s remains were cremated, and Mrs. Pope scattered his ashes. Specialist Jeter was survived by his mother, Brenda Jeter-Collier, a fiancée, and three children; Brandon Jeter (13), Brittany Jeter (9), and Kayla Curry-Jeter (6). 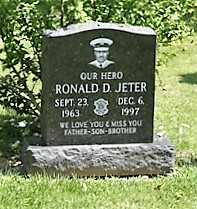 He was laid out at the Thompson, Hall, and Jordan Funeral Home on Gilbert Avenue on December 11, 1997. Again, thousands of mourners passed by his casket, including officers from as far away as London, England. The next day, more than a thousand police officers in hundreds of cars escorted him north on Interstate 71 to funeral services at the Rhema Christian Center on Agler Road in Columbus, Ohio. On the expressway, every entrance was closed and there were firemen, policemen, and citizens saluting at every overpass. He was buried in Section 8-D, Lot 74, Grave 4313 at Evergreen Cemetery in Columbus. The Police Division retired Badge Numbers PS121 and P256. The funerals of the Officer Pope and Specialist Jeter were the first so widely covered by video broadcast media. These were also the first two Cincinnati officers killed in the line of duty after the invention of the World Wide Web in 1993. On April 1, 1997, the Cincinnati Police Division became the first in America to publish a law enforcement website and it included the first law enforcement memorial. 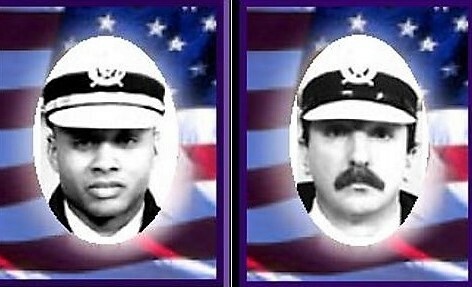 Eight months later, Officer Pope and Specialist Jeter were the first to be added to that memorial after its publication. At the annual Police Memorial Ceremony during May 1998, Officer Pope’s and Specialist Jeter’s names were inscribed on the Cincinnati Police Memorial. Cincinnati Police Officer Steve Saunders’ parents, Rusty and Christine Saunders, attended the ceremony. They inquired of their son as to whether a location existed to which they could go to learn about the nearly 100 officers who previously died in the line of duty. That served as impetus for a meeting between Mr. Saunders, Mrs. Saunders, and P.O. Steve Saunders and Specialist Richard Gross; which grew into a meeting of several at the Cincinnati Police Academy on August 19, 1998. That meeting resulted in the formation of the Greater Cincinnati Police Historical Society, incorporated on May 19, 1999, and the opening of the Greater Cincinnati Police Museum on June 21, 2006 – where 206 regional line of duty deaths are currently commemorated. If you have information, artifacts, archives, or photographs of these officers or the incident, please contact the Greater Cincinnati Police Museum Director at memorial@police-museum.org. This narrative was researched and revised on November 19, 2017 by Cincinnati Police Lieutenant Stephen R. Kramer (Retired), Greater Cincinnati Police Museum Director. All rights are reserved to him and the Greater Cincinnati Police Museum.